Is 2018 poised to be the year for virtual reality? Reports on the technology’s adoption and consumer readiness have varied for some time. But, recent information indicates the VR market could grow by 25% and become “mainstream consumer technology” before year’s end. Other figures support that estimation. According to Inc.com, in 2016, 8.1 million headsets were shipped to consumers worldwide. And, that number is predicted to jump to 60 million by 2021. VR adoption is indeed on the rise, which begs the question: Can brands employing or considering virtual reality marketing stay in step with consumers? An Ad Age article tells only 8% of marketers are using virtual reality. Instead, it says they’re relying on “more pragmatic” ways, including video and social media, to improve their marketing. Moreover, 57% believe the technology does not apply to them and 35% “either have no intentions or have reservations” about its use. Yet, three years ago, innovative brands were already paving the way. Seventy-five percent of the Forbes World’s Most Valuable Brands had already created a virtual or augmented reality experience or were contributing to the technology’s development. In the brief time since, we’ve been wowed by their mounting efforts. What was once technology for tech companies or only the largest players has grown to be event tech for all. Auto buyers can go on test drives without stepping foot in a car. Shoppers can virtually try on clothes and makeup. And, spirits enthusiasts can witness the making of alcoholic drinks without visiting a distillery. Despite what the 57% believe, virtual reality marketing has opened doors and broadened horizons for brands in a variety of industries. Their applications show the breadth of possibilities for engaging consumers in more meaningful ways. In truth, use of virtual reality can deliver or amplify the experiences consumers crave and provide brands’ new means to offer a stand-out activation. Further, Inc.com reports the technology to be the “perfect way to win Gen Z consumers.” And, Forbes explains the significance, sharing the generation is on track “to become the largest generation of consumers” in less than two years. It says they account for up to $143 billion in direct spending. These facts add up to one thing: the time to get familiar with virtual reality is now. Event marketers and agencies only need to follow a few best practices to launch with success. Event marketers and agencies can design a successful virtual reality experience when they ask themselves three questions. 1. How can we tell an exceptional story? Inc.com also mentions the excessive amount of content served to Gen Z, on top of themselves being “content curators” and technologically savvy. They have grand expectations, which is why the article says a focus on storytelling is the key to success with virtual reality. Yet, the Ad Age article urges brands “to find a use that makes sense,” such as one that is “entertainment, utility or social.” Regardless of the narrative, it’s important it ties in with the brand and shows its authenticity. For shoe company Toms, an effective story surrounds its charitable mission to give a pair to someone in need for each pair sold. So, using virtual reality marketing, the brand gave shoppers a panoramic view of a schoolyard, where poor kids received boxes of shoes. Consumers felt good knowing their purchases helped people just like these children. And, Toms got to show off its core values, drive purchase and create brand loyalty. Outdoor footwear and clothing brand Merrell went for a combination of entertainment and utility with its experience using Oculus Rift. This was in conjunction with the launch of their hiking shoe, the Merrell Capra. The Capra’s design allows it to traverse various terrains. So, that’s what the experience, dubbed Trailscape, gave them the chance to do. It tested their abilities to handle landslides and hazardous mountain tops – situations they don’t normally encounter. The result was a stimulating time, and one that made sense. 2. Is your experience the right length, coordinated and safe? Attention spans are getting shorter. Millennials are now clocking 12 seconds, and Gen Z only eight. Further, these groups are used to juggling three to five screens at one time. These stats show us that virtual reality marketing must not only make an impact through storytelling. It must also do so in a short amount of time. It’s the right equation to bank the highest total of consumer engagement minutes. Other factors include the physical elements of your experience. Consider sense of touch for example. Virtual reality marketing may have consumers reaching for components, and when not there, may leave an awkward feeling. Auto maker Volkswagen, a big proponent of virtual reality in internal and external interactions, saw this downfall. The brand is looking into haptic technology to simulate the feelings of a dash or gear shift, for instance. However, the Merrell activation, which used motion capture technology, was careful to incorporate a proper rope bridge for a full, immersive experience. In doing so, they were also careful to ensure participants’ safety, such as making certain no one could fall off the bridge. And, other activations should be mindful to certify no obstacles will affect well-being or the ability to have the best time. Fortunately, technology companies are developing ways to help users be active but remain safe. One such is Virtuix, which offers the Omni. Brands that employ Virtuix Omni allow consumers to walk or run and move 360 degrees during the experience, while tethered to a treadmill for their safety and utmost enjoyment. 3. How will you entertain people while they wait their turn? A new immersive virtual reality experience – Star Wars: Secrets of the Empire – is hitting locations in London and throughout the U.S. Forbes says it may be “the most entertaining VR experience currently available to the public.” And, it’s experiences like these, as well as brand activations deployed at SXSW, Comic-Con and other events, that draw large crowds and long lines. The fortunate news is consumers are generally happy to wait their turn. After all, FOMO keeps them there. But, event marketers and agencies who take advantage of these precious minutes in line are sure to see greater benefits. It’s an opportune time for event staff to strike up conversations with consumers. They can offer games and giveaways, take group photos, and even capture attendee contact information. 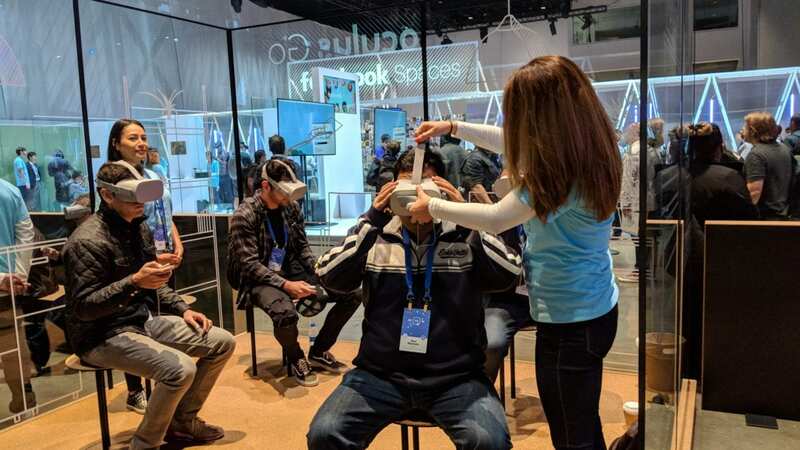 Interactions such as these are what keep personal relationships between brands and consumers alive, even when event tech and virtual reality are center stage. At Elevate, we have the industry’s largest pool of event staff who are experts in both activating virtual reality campaigns and establishing interpersonal relationships with consumers. Contact us to discuss virtual reality marketing and ensuring your brand stays in step with consumers on all fronts.